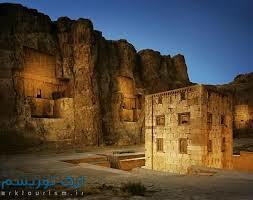 It is here, in the rock face of the Kuhe- e Rahmat that Darius I and three of his successors had their tombs dug. Like the later tombs of the two Artaxerxes at Persepolis, which were modeled on these, their outer façade, in the shape of a cross, has an opening in the center which leads to funerary chamber. The lower part of the façade is plain, while the central section is decorated with columns and capital, and the upper part with representations of the king beside a fire altar, held up by the vassal nations. Only the right- hand tomb, on the main cliff, bears an inscription which attributes it to Darius I (521- 485 BC). The single tomb on the far right is generally attributed to Darius II (425- 405), while the remaining two tombs (from left to right) are thought to be those of Artaxerxes I (465- 425 BC) and Xerxes I (485- 465 BC). Opposite the Achaemenid tombs is a square stone structure, known as the Kaabah-e Zardusht, or Kaaba of Zoroaster, and usually considered to be an Achaemenian fire temple. The walls on three sides have niches set in them which resemble windows while, on the fourth side, a door leads into the building this tower, probably built during the reign of Darius I, is one of only very few of its type still standing. It would probably have held the sacred fire of the Achaemenian. In 1936, while the base of the tower was being excavated, inscriptions were discovered on the outer wall. The first one, written in Middle Persian, is one of the four versions of the priest Kartir`s text (a longer version of this appears at this same site on the carving of Shapur‘s victory over the Romans). The second inscription, written in Parthian Arsacid Pahlavi, in Sassanid Pahlavi and in Greek, tells of Shapur‘s campaigns against Rome which ended in one case in the death of Cesar Gordian, in another in the defeat of a Roman army 60,000 strong and in the capture of Anffochus, and in the last case in the capture of the Roman emperor Valerian in 260 AD. The importance of these inscriptions for the understanding of Sassanid history is vital: indeed, without Karin inscriptions his very name and the role he played in the development of Zoroastrianism would be completely unknown to us. As for Shapur‘s text on his Roman campaigns, it is the direct equivalent of Darius Achaemenid text at Bisetun.